Written by Catherine Saxelby on Wednesday, 01 December 2010. You have probably heard of Sebago, Desiree or Kifler potatoes, but have you heard of the Carisma potato? This new variety of potato has just hit the shops riding on its claim to be the first low Glycemic Index (GI) potato. It is grown in South Australia and only available through Coles supermarkets. 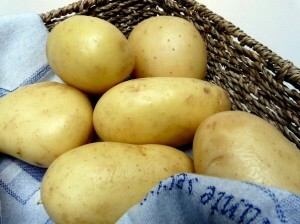 The potatoes have an oval shape, white skin similar to the Nadine potato and pale yellow-coloured flesh. Almost all potato varieties can be used for boiling and mashing, Kipfler potatoes perform and look great in salads while the Nadine, Red and Royal Blue are exceptional at dry baking/roasting. The label of the Carisma potatoes states they are ‘excellent for roasting, boiling and in salads’ so I put these methods to the test. The official low GI method for cooking the Carisma is to wash the potatoes, leaving the skin intact, chop into 1 cm thick slices, add to hot (but not boiling) water, then bring to the boil again and cook for about 4 minutes until 'al dente'. How: Both potatoes were washed, skins left intact, placed in a pot of cold water, bought to the boil then boiled for 20 minutes. Boiling time for the Carisma was the same as for the Sebago. The Carisma has an even texture, making it easier to cut smoothly after boiling; the Sebago has a somewhat more flaky texture, making it more prone to crumbling when cutting. I found the Carisma has a very smooth mouth-feel and a creamier taste than the Sebago. The Carisma has the advantage that its very fine skin is very edible (but can also be peeled easily if need be); the Sebago skin is easily removed too, but a little too tough to be eaten. SALAD: I boiled both varieties of potato and used them to make a nicoise salad. Both were equally tasty, but the Carisma won as it kept its shape when cut and tossed through the vinaigrette dressing (see photo). How: Both potatoes were parboiled for 10 minutes, cut into quarters lengthways, coated with olive oil and then oven roasted for one hour. I found the Carisma potatoes were more flavoursome; however, they cooked a little darker yet didn’t crisp on the outside and were also more oily in appearance and taste. In contrast, the Sebago potatoes cooked to a golden colour, were crisp on the outside, soft centred and looked and tasted like potato wedges; however, they are a plainer/starchy tasting potato. Admittedly Carismas do NOT claim that they're good for dry baking, frying or mashing but I tried out of curiosity. How: both the Carisma and Sebago varieties were dry baked with the skin, on a rack in the oven at 200C for about one and a half hours. Eaten whilst hot, the Carisma had a nutty, almost pasty flavour, but after cooling had a taste similar to mash potato; the potato is still flavoursome even when it has cooled down; the skin is very edible. The Sebago had a very dry, starchy flavour (a little butter or a drizzle of oil or dollop of natural yoghurt would compliment it nicely); it was not so nice when it was cool and the skin is too tough to eat. How: Both potatoes were cut into strips (chip-shaped) and shallow-fried in regular olive oil. The Carisma potato itself was tasty and the skin could be left on (it’s almost invisible) but they had a stripy appearance after cooked, absorbed a lot of oil and went soggy almost immediately after cooking – not a good chip potato at all! The Sebago chips, on the other hand, were great – crisp on the outside, soft in the centre, even coloured and they kept their shape till eaten. Unlike the Carisma, they are best peeled. How: both varieties were boiled, mashed with a potato masher and equal quantities of butter and low fat milk added. The Carisma had a creamier taste and a smooth texture which ‘melts in your mouth’ and easier to swallow; interestingly, it keeps its moisture as it cools. The Sebago has a starchier taste, requires more effort to swallow and becomes drier as it cools. Nutritionally, all potatoes are a good source of carbohydrate, fibre, potassium and vitamin C. The only nutritional advantage that the Carisma potatoes have over other varieties of potatoes is their low GI. The GI is a ranking of foods containing carbohydrate from 0 to 100 that tells us how much a food will affect blood sugar levels. Foods with a GI of 55 or below are considered low GI, 56 to 69 medium, and 70 and above are considered high GI. Carisma has an official low GI of 55, which is up to 45 per cent lower than other potatoes. The Carisma website outlines the cooking method which was used to work out the GI. Studies have shown that eating low GI foods can help keep blood sugar levels low, so less insulin is needed. Therefore, nutritionists recommend that we include at least one low GI food at each meal, especially for anyone with diabetes or insulin resistance or PCOS. The Carisma can improve the variety of low GI dinner carbs for you – you don't have to eat only pasta or legumes all the time. For potato lovers, that's good news! And you're more likely to stick to your eating plan. You can buy the Carisma potatoes at Coles supermarkets, alongside all the other types of potatoes. The potatoes are packed in 2kg plastic bags, which have a prominent rich-brown colour (see right). Being fresh produce, not surprisingly the shelf life is short – about 10 days. They are also competitively priced (prices in table below as of 26 Nov 2010). Although Carisma claims to be "excellent" for roasting and boiling, it rated on par with the Sebago, not better than it. For comparison, the Sebago scored slightly better for roasting while the Carisma higher for boiling. When you take into account all cooking methods (as a shopper would do), the overall winner is Sebago. However, from a nutritional / health perspective, Carisma stands head and shoulders over the rest. I would definitely buy the Carisma potatoes again for boiling, mashing, salads or dry roasting, but I still prefer other varieties for frying and roasting.